Since 2012 the schools games become bigger every year. Competitions involving Primary & Secondary schools from all across the county are held over the school year. Members of Deer Park Archers (comprising coaches & volunteer coaching assistants) help during the year to support this amazing programme and Active Gloucestershire played a huge part in the success of the activities! So late March 2019 saw our first Secondary School Level 3 County Finals taking place at Cheltenham College, where teams of 12 battled it out, qualification/ranking rounds in the morning, head2head eliminations in the afternoon. The finalists had qualified through District Finals that had taken place at various locations during the indoor winter season. As a consequence of running the programme during the winter season the teams were much stronger and competition levels much higher! Following every type of weather possible during the qualification rounds, we had some pleasant sunshine in the afternoon and despite some close encounters in the quarter finals the top 4 seeds emerged, Balcarras, Stroud High, Denmark Road and Sir William Romney in that order. Despite close matches, the results followed form and Balcarras, who certainly raised their game triumphed one again. The Primary School programme is already in full swing and the District finals will complete during April & May. With record numbers of entries (more than 120 teams of 9) competition for the final 10 places will be intense. Watch this space! In 2018 there was another 13% increase in school games participation levels with an amazing 128 primary schools registering to compete in the programme! Numbers of secondary schools participating have remained constant but with the throughput of the primary school programme a big jump in secondary school participation is anticipated in the future, where for the first time there will be 2 competitions running, offering Key Stage 3 and 4 options at varying times of the year to avoid clashes with examination time! One of many District finals, this one took place indoors! The culmination of a years activities in school clubs which take place after-school, lunchtimes, breakfast and in-curriculum time is the finals days which are fantastic. Teams have to qualify for the finals by winning their District finals which can see as many as 20 teams competing for just 2 places from each district! 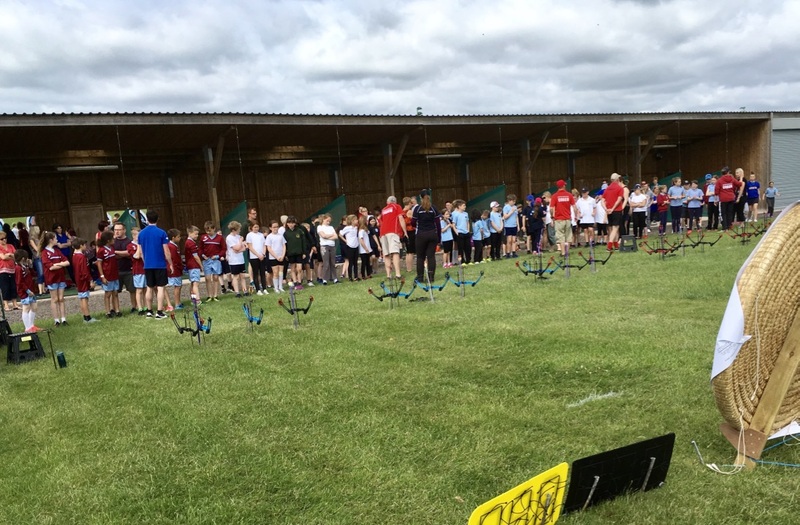 School Games Finals have been successfully held at Hartpury College for several years and have seen hundreds of archers from schools across the county compete on a team and individual basis. This is a fantastic way to engage pupils in sport throughout the year. 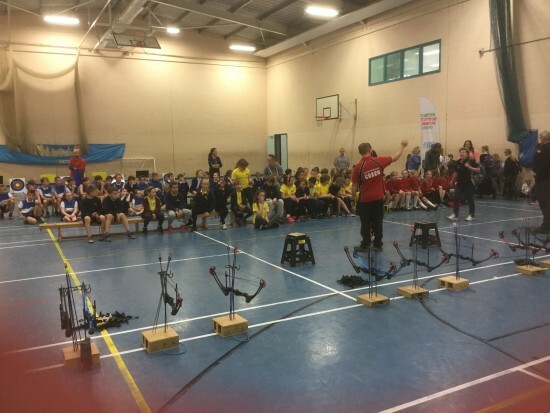 Working in partnership with Xperience archery we run lunch time, in curriculum time and after-school clubs in Primary, Secondary, College, Recreation Centres and Special Needs Schools. Providing help with the coaching, equipment and the general supervision as required. In parallel the club supports the development of coaches and encourages pathway links with other local clubs. Organising inter-school competitions and the Gloucestershire school Games which are open to all pupils that are competent archers, is also a key focus for the us. In addition, we support activity days, house matches, GCSE, D of E etc. and are seeking to involve pupils that enjoy shooting, officiating or generally volunteering to support the sport. 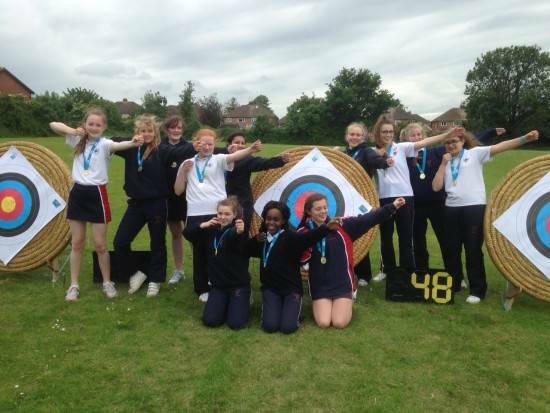 Club members also train School ‘Sports Leaders’ to deliver ‘Arrows’ (archery for 5-7 year olds) in the Primary schools. Our sport is very inclusive and are more than happy to work with a range of physical disabilities and SEN pupils. Our sport brings the best out of those tagged as ‘non sporty’ and we have had some amazing results from that population. Some going on to become British Champions!